20............. Anna Couture Boutique, Stamford, feature. 56............. Your finances – Pensions. 58/61...... What’s on – Events and gigs guide. 62............. The Puzzle Page – Valentine’s Day special. 65 ............ Words from the Mayor. 66............. Pets and Vets. 67............. Fenwood Dog Grooming feature. 73/78..... Classified businesses directory. is a fun and simple, all-inclusive group ﬁtness programme, choreographed to popular and underground dance music, including a wide range of music styles such as house music, garage, R&B, mainstream dance music, and more! WEIGHTED WORKOUT - Change the shape of your body with this low weight load, highrepetition weighted class that builds lean muscle tissue and burns fat. Transform and sculpt your body...fast! An “old school” AEROBICS CLASS with options to suit all levels. Set to some great music you will be having so much fun you will forget you are working out. BOX FIT - A great class for all-over conditioning and calorie burn. Utilising gloves, pads and kick pads to rehearse boxing moves this will work your whole body top to toe. Work up a sweat, tone up and have fun releasing some stresses and strains of life! of the brain can sometimes overreact and set up patterns of fear or thought that you find difficult or impossible to control. “Too many of us are not living our dreams because we are living our fears.” The good news is that your brain has an ability to learn and change; in fact you are constantly learning. Changing and learning new habits such as being more relaxed and calm can help overcome simple phobias very quickly. Now, here’s an interesting fact; habits exist on the same subconscious level as phobias, and hypnosis helps create new habits or patterns of behaviour. The basic feature of any phobia is a conflict between the conscious and subconscious. Hypnotherapy communicates with the subconscious, filtering through how the client wants to be, rather than how they currently are. Solution Focused Hypnotherapy helps with all these different types of phobias, allowing you to feel free to live a normal life again. Christine understands the potential problems the recipient of a fear or phobic response can have on their lives, and the restrictions it can bring. All treatments are tailor-made to the individual’s personality. Christine is able to help with almost all phobias and fears, and you will be pleasantly surprised how common they can be. Ready to take your next step? If you’re wanting to stop your fears and phobias, contact Christine who will be pleased to help. February Promotions Bright eyes facial £23.00 This facial starts of with a relaxing cleanse to the face and neck area, tone, eye massage, and to finish with, we will apply the hyaluronic eye pads which will leave your eyes bright and refreshed. Slimming World with Tori – Slimmers Lose a Phenomenal 325 Stone in One Year! MONdAy Elsea Park, Community Centre 9:30am - 10:30am “Not Just Aerobics” Simple routines, easy to learn, fun to do, whatever your age or ability, followed by muscle strength and endurance exercise. You will re-awaken those tummy muscles, tighten the bottom and tone the legs. You won’t need leggings nor leotards for these classes. The Centre@Elsea Park 10:45am - 11:45am “Prime Time Active” Gentle exercise routines for the “young at heart” who are able to comfortably stand/walk. Includes simple moves to music and strength exercises. TuEsdAy Essendine Village Hall 1:30pm – 3:00pm “Prime Time Gold” A gentle workout class, mixing standing and seated fitness routines. It is essentially functional fitness to help with everyday movement. Forty-five minutes of simple routines, followed by a cup of tea or coffee and a sit down and chat. “A relaxed club environment with fitness thrown in for good measure”. Lawrance Park Hall, Thurlby 7:00pm – 7:45pm “BOOTCAMP” An upbeat, high energy H.I.I.T. class. Get ready to sweat! Using H.I.I.T. (high intensity interval training) principles of short bursts of exercise followed by short rests, this class gives a TOTAL body work out, cardio, toning and strengthening. A “low-impact” version of H.I.I.T, this class suits all fitness levels and ages. Our Pick of the USA’s Best Beaches Daytona Beach, Florida Close on twenty-five miles of golden sands, with plenty of shopping, dining and entertainment, it’s the perfect beach for families, with activities from water sports to cycling along the promenade, plus the world-famous speedway. Or you can simply soak up the warm Florida sunshine. Travel Counsellors Top Tip: Daytona has some gorgeous beachfront parks, with pavilions for fishing, splash parks and picnic areas. Clearwater Beach, Florida Named the USA’s number 1 beach by TripAdvisor in 2018, Clearwater Beach boasts inviting soft sands and surf. The Gulf waters are warm and the long beaches are teeming with activities and water sports. T.C. Top Tip: Do the Beach Walk, a $30-million redevelopment initiative that has transformed the look and feel of south Clearwater Beach. It’s a broad, winding promenade surrounded by resorts, beautiful white sand, entertainment and art. Sanibel and Fort Myers, Florida The area is home to plenty of gorgeous beaches including Boca Grande Beach on Gasparilla Island and five additional beaches facing the Gulf of Mexico. Familyfriendly resorts and Gulf-side seafood restaurants can be found on the six miles of white, sandy coastline. TC Top Tip: Try island-hopping in the shallow waters of the Pine Island Sound. Visit one of twenty marinas where you’ll find a variety of charter and sightseeing cruises hopping between islands, including Cayo Costa (a state park), Cabbage Key and Boca Grande. Miami Beach, Florida Trendy and quirky, Miami Beach attracts the rich and famous with its miles of golden sand and glittering nightlife. Roller skate down the promenade, enjoy people-watching on the beach and admire the historic Art Deco architecture. TC Top Tip: Rent some chairs at South Beach’s 12th Street Beach to do some people-watching. Just look for the rainbow flags posted at the lifeguard stations. Santa Monica, California Probably the most iconic beach in “SoCal”, Santa Monica offers glorious expanses of beach, biking trails and activities. The famous pier features everything from rides and amusements to bars and restaurants and on the water, you’ll be able to surf and paddleboard, with lessons and rentals available. TC Top Tip: Right on the seafront, the Annenberg Community Beach House is open to all and offers spectacular views, a splash pad, a beach area, a courtyard, a view deck, a playground and more. Malibu, California Malibu is a beach-lover’s dream, with nearly forty of them to choose from, from the iconic Surfrider Beach to the cave-like rocks and cliffs of El Matador State Beach. Make sure you stock up on supplies as some of the beaches are so private and secluded you may be the only ones there. TC Top Tip: Visit Paradise Cove for a long beach walk past the Malibu mansions and find some secluded beaches to explore along the way. To find out more information or to book you holiday, contact Clare Lockett, Travel Counsellor. including some from Chanticleer, a top British bridalwear designer and manufacturer. The opportunity to buy the Chanticleer label proved irresistible for Anna-Maria and that prompted the expansion on to the High Street (literally). Now, Anna-Maria and her team are in the process of producing their first Chanticleer capsule collection, which promises to be stunning and with trademark theatrical touches to express individuality. Anna-Maria had previously run her own bridal studios in North London and Gerrards Cross for many years, so her experience is vast. Furthermore, she has the trained expert’s eye to understand a bride’s vision for her wedding dress and then the skill to produce a breathtaking end-product. The Anna Couture Brides premises contains work rooms and stocks of beautiful fabric, whilst Anna-Maria and her team are adept at ensuring that the bride-to-be will enjoy her memorable couture experience, as her dress design takes shape before her very eyes, or a gown is altered to fit perfectly. There can be little doubt that you’ll walk away feeling that your particular needs and wants for that special dress will be satisfied and that your wedding dress will have you feeling like the star of the show! Dessert Assiette of desserts to share: Mini lemon mousse cheesecake, Chocolate dipped strawberry, Mini chocolate fudge cake & mini raspberry posset Or White chocolate, raspberry & prosecco cheesecake bar, praline soil, passion fruit drizzle Or Sticky toffee pudding, Cornish clotted ice-cream Coffee and Petit Fours Wine Flight available with each course £15.00 per person. Brooke Peverell. Refreshments will be served during the session and there is no charge to attend. If you would like more information about this group, please contact Heather Culshaw on 01778 393459 or e-mail Heather.Culshaw@ salvationarmy.org.uk We would also like to say a heartfelt thank you to all who attended our annual Christmas Carol Service at Bourne Corn Exchange. It was wonderful to share the evening with you and a huge thank you for the very kind donations from that evening. We raised just over £500 – which will be used for our continuing work within the community. Wishing you all a very happy new year and with every blessing from all of us at Bourne Salvation Army Community Church. Bourne Westfield Bourne Westfield Primary Academy opened its doors to the community’s youngest musicians and their parents, guardians and carers on Tuesday January 15th for a New Year of music making. enough to win herself a Canon EOS Camera. Congratulations to you both and enjoy snapping away! Ben Utteridge receiving the cheques from David Tooze (Bourne Rotary) and Jenny Spratt (Deepings Rotary), with James Husbands on the left. which is not Government-funded. The Rotary Clubs of Bourne and Deepings were delighted to make a joint funding to the Willoughby School. In addition, two cheques of £500 each were presented by Mrs Jenny Spratt, (President of The Deepings Rotary Club) and Mr David Tooze, (President of Bourne Rotary Club) to Mr James Husbands of Willoughby School as a contribution for the event in 2019 where a new set of students will have the opportunity to undertake a similar experience at the Adventure Holiday Centre. “Tim the Swim” Raises Cancer Research Cash One of the more unusual challenges taken on by someone living around these parts, so far from the coast, must surely be a long-distance swim in the sea, in order to raise money for their preferred charity. Local hero, Tim France, (self-confessed “39 and not a very fast swimmer”) took the plunge, literally, on September 17th last year and swam to the Isle of Wight from the mainland, aiming to raise £1,000 for Cancer Research U.K.
Easter Weekend Friday 19th April - Friday Fish menu Sunday 21st April - Easter Carvery. Bank Holiday Monday 22nd April Family Fun day, with Easter crafts and games for the kids and an Easter egg hunt. Family friendly menu. Shakespeare’s “Twelfth Night” to be staged at Peterborough Cathedral One of Shakespeare’s best loved comedies, “Twelfth Night”, is to be staged at Peterborough Cathedral from February 13th to 15th by Gearbox Theatre Company. This talented new theatre company is combining the Cathedral’s stunning Norman architecture, a sixties skiffle band and Shakespeare’s poetic language, to bring this colourful production to life. Artistic Director, Emma Sheppard, explains: “It is the swinging sixties in Illyria where music really is ‘the food of love’. Cesario loves Orsino, Orsino loves Olivia, Olivia loves Cesario … but Cesario is really Viola, Sebastian’s twin sister … and is Sebastian really drowned? And then there is Malvolio … cruelly deceived into yellow stockings and crossed-garters by the riotous rogues of this enchanting tale. There is love and marriage, laughter, mischief and crossdressing. With a sixties skiffle band and an original, if somewhat nostalgic, soundtrack, this is a show not to be missed.” Tickets, from £11 - £25, are now on sale via www. peterborough-cathedral.org.uk/twelfthnight or call Peterborough Information Centre on 01733 452336. As well as the three evening performances, there are matinees on Thursday 14th and Friday 15th February, and these are open both to the general public and to schools. replant the disturbed bulbs as soon as possible. Make sure that you have got all of your seed potatoes by the end of the month and that they are spread out in a seed tray, or in egg boxes, in a light cool room where they can “chit” (sprout shoots), before being planted out. If the “chits” look pale and spindly, the room is probably too warm or too dark. The soil can be prepared for the spring planting by completing the winter digging, if not already done, removing any weeds that have survived the winter months. To warm up the soil for planting next month, cover it with fleece or polythene and, if you haven’t already, add well-rotted manure or compost to the prepared soil. Other jobs that can be carried out are:• Removing dead leaves from cabbages and sprouts –if they start to rot they can spread mould and mildew. • Make sure winter cabbages, cauliflowers and broccoli are netted against hungry pigeons, whose food supply is a little short at this time of year. • Spray fruit trees, whilst they are still dormant, with a plantoil based winter wash to help prevent aphids and scale insects. • Feed and mulch fruit trees and bushes. 1 bed, 2 bed or 3 bed homes – Which Sell the Best in Bourne? And today … 106 days ... does that surprise you with what is happening in the UK economy? Therefore, if you are looking to buy and plan to stay in the buy to let market a long time, perhaps take a look at the Bourne properties that are sticking as there could be some bargains to be had there? Want to know where they are ... drop me a line and I will tell you a nifty little trick to find all the properties that are sticking. Thinking of moving home? Take a look at a new Allison home. Law of Intestacy might not achieve. Many people can lose out if a will is not made. For instance, unmarried couples must consider each other in their wills if they want to guarantee each of them rights. This is particularly important where the property is held in only one of their names. If we are concerned that our health may be failing, or we may have difficulty in mobility, appointing each other as ‘attorney’ may be advisable so that each party in a couple can assist the other. Before marriage or any long-term, live-in relationship, understanding responsibilities and rights of each of the parties is helpful. It is highly unusual, however, for couples to take legal advice unless they are entering in to a prenuptial agreement. Such agreements provide for what should happen if the relationship fails, and may be more effective in the early years depending on the circumstances. Advice must always be taken. Such agreements might also apply in cohabitation of unmarried couples. Declarations of Trust in Property will help. Are We Expecting a Price Growth in the Housing Market? ll the signs are there for a steady 2019 in the housing market. With more new buyers registering in January, we’ve experienced a surge in activity throughout Bourne and the surrounding villages which gives home sellers and buyers confidence in their spending. With these levels of activity comes the opportunity of an increase in property values, driven by confidence in the housing market. Brexit continues to make longterm and strategic decisions difficult for UK-based businesses and homeowners. Yet both the UK economy and its housing market registered around 3% annual growth in each of the first three quarters of 2018. Since the last troughs in GVA* in Quarter 4 2009 (Q409) and house prices (Q109), both indicators have risen by a similar magnitude of 36% and 42% respectively. The relationship between the two indicators, using annual % change on a quarterly basis, suggests a correlation of some form does exist, with changes in house prices lagging by approximately three months. continue to outperform in terms of annual GVA growth until at least 2020. *One widely-used indicator of overall economic performance is ‘Gross Value Added (GVA)’. It measures the increase in the value of the economy due to the production of goods and services. ** Office for Budget Responsibility, International Monetary Fund, National Institute of Economic and Social Science, Oxford Economics. Consumer Advice www.altoelectrical.co.uk Qualified male and female electricians, fully insured and NICEIC “Part P” registered. Available for all your electrical requirements. Tough Action Against Scammers By Eileen Le Voi - Safe Local Trades & Services A new crackdown on scammers has been launched across Cambridgeshire and Peterborough with the aim of making the county scam-free. The Cambridgeshire and Peterborough Against Scams Partnership (CAPASP) includes Cambridgeshire Constabulary, Police and Crime Commissioner Jason Ablewhite, Cambridgeshire County Council and Peterborough City Council. At the recent launch event, Police and Crime Commissioner, Jason Ablewhite, said: “Scams are becoming a part of our everyday lives but they shouldn’t be, as they are fraud and fraud is crime. Being a victim of this crime can have a devastating impact. These crimes often target those people in our communities that are vulnerable for a variety of reasons, including poverty, isolation, frailty, or disability, and this new partnership aims to look at how we can work together to make it harder for these criminals to continue to operate in our area.” Eileen Le Voi, Director of Safe Local Trades – which has been championing the consumer for over a decade – said: “As a member of the partnership, I am committed, on behalf of Safe Local Trades and Services, to this far-reaching charter. It is vital that we all work together towards one common, and very important, goal of raising awareness about scams and ending the financial and 18:00 mental suffering caused to individuals on a daily basis.” Statistics show that • 53% of people aged 65+ have been targeted by scams and criminals (Action Fraud). • Scams cost the UK between £5-10 billion each year (Annual Fraud Indicator). • Anyone can be a scam victim, regardless of age, gender, education or economic background. • Scam victims might not always admit (or be aware) that they are a victim of a scam. Only 5% of victims report the crime (Age UK 2015). • Scams are the product of organised, predatory criminals who gain trust to exploit and steal money. For support and advice on scams (e.g. rogue traders, romance scams, scam mail, telephone calls, text messages, e-mails), call Citizens Advice Consumer Service on 03454 04 05 06. For a non-emergency response, (if you have been a victim of a fraud/scam), call Cambridgeshire Police on 101. If you have been affected by crime, get emotional and practical help from Cambridgeshire Victim and Witness Hub on 0800 781 6818. To report a fraud, or suspected fraud, and share information to help stop others from becoming victims, call Action Fraud on 0300 123 2040. For information on how to become a ‘Friend against Scams’, please go to https://safelocaltrades.com/ consumers/advice/friends-against-scams. - Creative Writing Group meeting in the Windmill Room at Wake House, Bourne at 7pm. Everyone welcome. their February meeting at Bourne Corn Exchange. Barry will be talking about “The History of UK Stock Car Racing -And Me!” This will include the origin of the sport in 1954, his involvement, description of tracks and the progression towards homebuilt “Specials”, including the one he built himself and won the World Championship. Membership subscription is £20 per annum, new members are always welcome. Doors at 7pm, presentation at 8pm. ‘Love Lincolnshire Plants’ : a talk by Project Officer, Aidan Neary from Trust HQ. This National Lottery-funded project aims to create and preserve a collection of plants from Lincolnshire and to train and inspire young people to become the botanists of the future : 7.30pm at Bourne Methodist Church: open to members and non-members, £1.50 donation at the door. For any enquiries about the trust, e-mailLWTBAG2018@gmail.com. to all film club members, doors open at 7pm: bar. Membership is free to all: to join please e-mail filmclub@elseapark.co.uk. Photographic Exhibition’ will be held at the Deepings Community Centre, Douglas Road, Market Deeping, PE6 8PA from 10.00 a.m. - 5.00 p.m. on Saturday, and Sunday from 10.00 a.m. - 4.00 p.m. Please come along and view the work of local photographers and vote for your favourite images. Free entry. - Final snowdrop opening of 21 Chapel Street, Haconby, nr Bourne for the NGS as a tribute to Cliff Curtis who sadly died in May. 11am to 4pm; homemade soup and cakes will be available. up warm for a winter walk full of snowdrops and winter flowers and enjoy delicious teas and homemade light lunches in the tearoom. For opening hours and further information, visit www.visiteaston.co.uk. chill out and relax at Bourne Baptist Church Hall, West Street at their Chill ’n’ Chat free drop-in sessions, from 10am-12noon. If you need support, help or advice, volunteers are on hand to assist. All welcome - young or old. is standing at well over £320, if it’s not already been won! 15th - Lincolnshire Wildlife Trust, Bourne Area Group Meeting. 17th - Quiz Night at the Masons Arms, £1 entry, and the jackpot featuring songs from the new and the original films. 9.30am -4pm for ages 5-13yrs, £20. For details and booking visit www. stamfordartscentre.com or phone 01780763203.
will be talking about “Fools and Horses: the Victorian Circus.” Commencing at 2.15pm at Bourne Corn Exchange, doors open1.45pm and admission is £1. New members and visitors are always welcome. If you wish to know more, ring 01778 425786 or visit their website www.u3abourne.org.uk. - Oliver Kids: a three-day workshop, at Castle House, St. Peter’s Hill, working towards a performance showcase, based on the story of Oliverat Stamford Arts Centre. 9.30am-4pm ; ages 5-13, £70. For details and booking visit www.stamfordartscentre.com or phone 01780763203.
spectacular based on songs from the famous film. 9.30am-4pm,£20, for ages 5-13, £70. For details and booking visit www.stamfordartscentre.com or phone 01780763203. 21st - 10.30am till 12.00pm THE MUSIC MAN PROJECTat The Salvation Army, Manning Road,Bourne. A music workshop for adults with learning difficulties - carers and assistants of essential needs all welcome. 22nd - Arts Around Town: a day of family-friendly activities in the Arts Centre and around Stamford - most activities are free. For full details, visit www. stamfordartscentre.com or phone 01780763203. Salvation Army, Manning Road, Bourne. Bacon butties, toasties, tea and coffee: Sales tables with allsorts.Come and meet up with your friends. Corn Exchange, doors open to the public at 9.30am. Come and enjoy filled rolls and home-made cakes, all proceeds to the NSPCC. To book a table, phone Audrey on 01778426487. 7.30pm at the Darby and Joan Hall, South Street, will be followed by a demonstration by Lesley Beeton with her title”Country Living”. Visitors always welcome. 10th - Haconby Unplugged, Singaround song session at the Hare and Hounds, West Road, Haconby, Bourne. 8pm start. For further details, phone 01778 425422. 15th - Back again at the Masons Arms, Bourne, Nick Jarman singing songs from the ’60s to the ’80s: 9pm start. 2nd - Live Country Music evening at Masonic Centre Hall, 1-2 Roman Bank, Bourne, Lincs PE10 9LQ. First-class Country singers from around the UK, this month Daniel Berry: whether you’re a line dancer or a listener, these evenings are for everyone who appreciates good Country music. Entrance £9: no bar, so bring your own drinks. For further information, phone Donna 07718972329 or email DCALiner@aol.com. Hounds, Haconby, For further details, phone 01778 570115 or dean.hardy880@btinternet.com. 2nd - Karaoke tonight at the Masons Arms with Nick Glover: 9pm start. John Clare Cottage, Helpston: with tunes from the time of John Clare plus their own music. Ticket-only, available from Clare Cottage 01733 253330. Licensed bar. 16th - Splinter Group tonight at the Masons Arms, Bourne : 9pm start. Bourne - 2pm to 5pm - details: Rick and Annette 07827953252 or Dean 07595-219357. 3rd - Relax and unwind on a Sunday afternoon whilst listening to good music and enjoying a drink. Pennyless at Mama Liz’s : 4pm-6pm, admission free! unwind whilst listening to some superb local talent at the Key Theatre bar Peterborough: 2.30pm – 5.30pm, doors 2pm. This month;Resonate, Crybb, James Edmonds and SheBeat. 3rd - Open Mic 8pm at the Hare and Hounds, West Road, Haconby, Bourne, PA and soundman provided. For further information, phone 01778 571428.
at 8 00 pm. Stamford Jazz Music Society presents The Toft House All Stars. Guests include Richard Exall (clt/sax), Amy Roberts (clt/ sax) and Bill Coleman (bass), all from The Magnificent 7 Jazz Band.Admission £10, booking advisable, 01778 590335. Session, 8pm at the Hare and Hounds, 2 West Road, Haconby, (3miles north of Bourne) hosted by Pete Shaw and friends (some music available if you contact in advance) - 01778 571563 or pete@peteshaw.co.uk . To book a 6pm meal with the pub before the session, phone 01778 570521. Masons Arms tonight at 9pm. cafe, Woodgate, Peterborough, PE6 7ED: 6.30 for 7pm start. Organiser: Rev. Dave Maylor (blues guitar) - details 01733 253330. Bourne Academy, will be singing at Stamford Arts Centre Cellar Bar at 8pm. Entrance free. - If you enjoy Irish Country and ’60s music, then go along to the Masons, Bourne at 9pm and listen to Dean & Co.
A School production by arrangement with The Really Useful Group Ltd.
bottom left of your desktop and click Settings (shaped like a cog). • Now select System then Storage. • Click on Free Up Space Now. Your system will now be scanned. When complete, various areas will be listed where disk space can be recovered. Some of these will be significantly large (in the example shown, old Windows Updates are taking up over 9Gb of storage space). Windows will automatically select sections which it has determined are safe to remove. Burghley Centre and SKDC to endeavour to establish whether there is any possibility of securing residents’ car parking facilities within the existing car parks, following the introduction of the charging policy by the Centre’s landlords. • The Council is to write to SKDC to notify them of the interest expressed in securing the protection of the rail bridge within the Elsea Park development area, it being one of the few structures remaining from the local railways’ era. 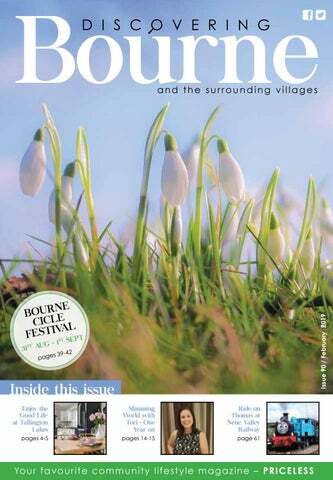 • Subject to a small number of issues still to be finalised, the “Bourne Cicle Festival” will take place on the weekend of August 31st / September 1st. Further details are to follow. For queries or information on the above, please contact Ian Sismey on clerk.bournetc@btconnect.com or on 426123. In my first paragraph, I refer to a well-known quiz with reference to the ‘ B ‘ word. Other similar programmes spring to mind ......”Question Time”......”The Weakest Link”......”Countdown”.......My only real hope is that the whole debacle is not.......”Pointless”! Fenwood Dog Grooming Bev Bradford has always been surrounded by animals. At a very young age, she received her first pet, a hamster, as a christening present. Bev now has four dogs, three horses, sheep, chickens and a ferret. open from Mondays to Fridays. Bev always had the ambition to work for herself and combine it with her passion for caring for animals. Last year, she achieved her goal and changed direction from her previous career (working in Special Educational Needs) and re-trained as a dog groomer, whilst working at a local successful, dog grooming salon. Your next event catered for! Order a bespoke afternoon tea or traditional buffet for your next event. The Clock Shop Watch & Clock repairs & restoration EXCELLENT DOMESTIC CLEANERS AVAILABLE IN BOURNE NOW!